Part of the greatness of the event was the record breaking audience numbers who tuned in: 73 million viewers. The little studio held a grand total of 728 seats, even in the face of the 50 000 ticket demand. And poor Frank Gorshin (who would later find fame as the Riddler on the Batman TV series…) who was on the show as an impressionist had no chance to make any sort of, um, impression. Even Davy Jones, who sang “I’ll Do Anything” from the musical Oliver that same night would have to wait a year or so to join the Monkees before he could get the kind of love these four guys from Liverpool were getting. 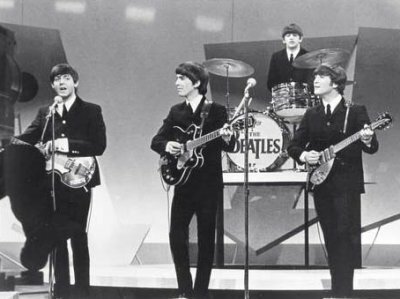 The show was all about the Beatles, whose hit in ‘I Want to Hold Your Hand’ alone had preceded them to the States, spearheading what became the group’s success, embodied in what was called Beatlemania. And Beatlemania wasn’t just all about girls screaming and fainting. That night, all transportation was in gridlock. The TV sets of the nation were held captive by the curious as well as the devoted. And criminal activity across the continent? – fegeddaboudit! According to urban myth, even the criminals stopped their nefarious activities to tune in. The group would appear on Sullivan’s show a number of times during the decade, initially in person on this single historic date as well as on film. But, the excitement of that first night was a revolution; not just for the Beatles or for pop music, but for television, and for the culture as a whole. Bands were formed because of this appearance – it was a historical event, gone well beyond the light entertainment of Sunday night’s past. And, as mentioned, everyone watched; everyone. It drew people of different circumstances, beliefs, and cultural backgrounds together, a glimpse at a possible future when it was possible for the world to stop for an instant in order to appreciate something that was intrinsically good. It is with a sense of bittersweetness to me that such an event of this kind will probably never happen again. But, maybe that’s another reason to celebrate it. Here’s a clip of the Beatles, performing their monster hit ‘I Want to Hold Your Hand’ the song that did what no other song from a British act at the time had done – break in America!